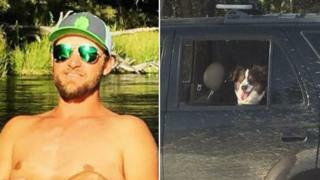 A man and his dog who were trapped by deep snow in their vehicle in central Oregon for five days survived by eating taco sauce, US police say. Jeremy Taylor, 36, and his dog Ally left to buy gas on Sunday 24 February but failed to return and on Wednesday a missing person's report was issued. He was discovered on Friday and told police that his vehicle had become stuck in snow. Police said he and Ally were in good condition "but hungry". Giving new details on the case in a post over the weekend, police said Mr Taylor told them he had slept overnight in his vehicle on Sunday but even more snow fell on the following day. He did not have a mobile phone. He and Ally attempted to walk away but the deep snow made it too difficult, so they returned to their vehicle. "Jeremy stayed warm over the next four days by periodically starting his vehicle and used a few taco sauce packets he had as food," according to the police statement. In a Facebook post, Mr Taylor gave thanks and said he had "got lucky, let's never do that again".